Milestone provides the scientific and industrial communities with the most effective, highest quality instrumentation for Microwave Digestion, Microwave Extraction, Microwave Assisted Synthesis, Scale-up, Direct Mercury Determination and Microwave Ashing. Metrohm Australia and Milestone S.r.l. (Italy) are pleased to announce their new exclusive partnership in Australia. Starting November 1, 2018, Metrohm Australia (formerly known as MEP Instruments) will be supplying and supporting Australian laboratories with Milestone’s state-of-the-art microwave technology. Milestone is an experienced and renowned manufacturer of advanced laboratory instruments such as microwave digestion, synthesis, extraction and ashing devices. The Milestone portfolio also features direct mercury analysers requiring no sample preparation, delivering results in as little as 6 minutes per sample. Milestone’s Clean Chemistry Line offers an innovative and complete portfolio of systems and accessories for analytical blank control and reduction in ultra-trace elemental analysis. 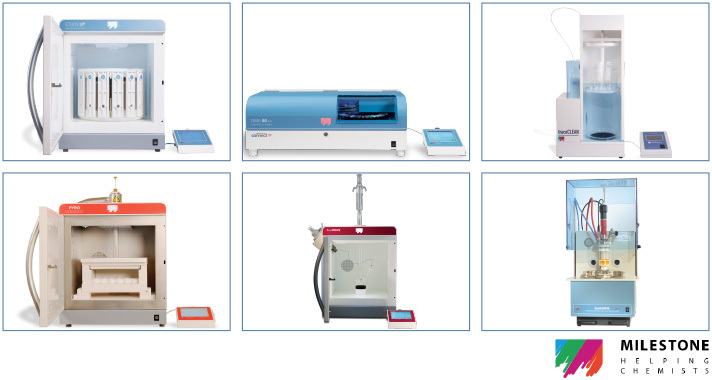 The instruments cover a wide range of applications, i.e. trace metal analysis; solid, liquid and gas samples preparation; environmental, food and natural products. Milestone Solutions are available in Australia exclusively at Metrohm Australia.